Triathlon & swimming are calling me! It’s time to move past thinking about athletic goals to doing those goals! Today I’m sitting in my office this fine, sunny, after the Jayden Polar Vortex that caused Minnesota to shut down, and I realized I’ve been doing a lot of athletic thinking. I’ve recovered from -50 degrees Fahrenheit temps, and finally I’m thinking about my athletic goals for 2019. It’s officially the “off season” for me. Meaning that this is the time of year that I am not training for any events. It’s been a bit of a loooooong off season, and I am finally itching to get back at it. When I was setting my goals in general for 2019, I specifically decided NOT to do a 100 mile bike ride or a long running event, because both of these, or a longer triathlon, take some serious training time. My time priority is to finish, finish, finish this book!!! I didn’t want to intentionally distract myself with athletic training, resulting in less time to write. What’s still on the table for events this summer will be my annual Tour de Cure Twin Cities bike event, and this year I am going to do the 62 mile route, the metric century. The Tour de Cure Twin Cities will be on Saturday, June 1st, 2019, which happens to be my brother Marty’s, who has type 1 diabetes also, birthday. Riding 62 miles does require training. It’s not advised to just go from zero to 62 miles in one day, so come the end of February, this month, I will have set up my bike trainer and gotten my bike on it. AND, best of all, I will have started riding!!! To get motivated to make this happen, I have begun my fundraising effort to be a Champion again, after all, I’m not holding my breath for a cure, even though I would love a cure. If you have any inclination to donate, here’s the link. 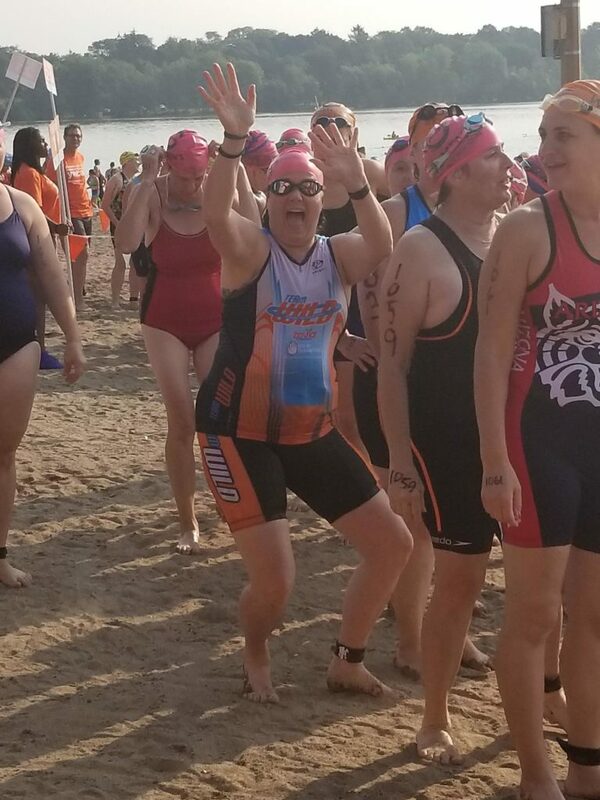 I will also again do the YWCA Women’s Triathlon with the Looking Sharp team. It’s a sprint distance (short in my world!) triathlon, but still does require training! That race will be on Sunday, August 11th, 2019. Plenty of time to start swimming and running again. Including doing open water swimming in the local lake. Speaking of which, I still have a gym membership and I go at least 8 times a month to get my gym reimbursement from my health insurance company, but I haven’t been swimming. I realized last week that I miss it. That is in essence what the off season is for. It’s to realize you miss the sports you love!!! I miss biking and swimming. Since I walk so much with Sammy boy, I confess, I don’t miss running. After all, I have never loved running with my whole heart, except for maybe a bit when I was in grade school and we did field days that included a few running races. I remember loving those days! What about you? Is this your off season? What athletic goals have you set for yourself for 2019? Please do tell. Hearing from you completely inspires me, and mutual inspiration is good for all of us! I miss your sassy self, Mari! I applaud your ability to get yourself psyched up to start exercising-you make it sound fun and that is not easy. Stay warm, be cool and know that your Colorado peeps think of you often. Can’t wait to read your book! So wonderful to hear from you!!!! I do miss all you wonderful Colorado people!! You got me fired up for a weekend of writing and walking. Maybe even set up my bike on the trainer!